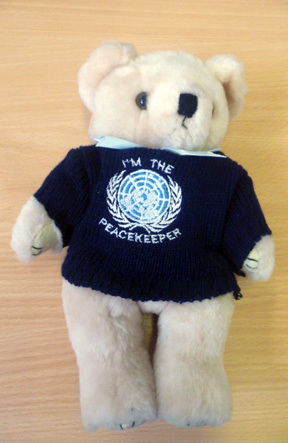 The Peacekeeper Bear was launched in May 1993 on the steps of 10 Downing Street. Many thousands have been bought by UN peacekeepers serving in many countries and by their families and supporters of the United Nations. The bear wears a navy blue sweater embroidered with the United Nations symbol.